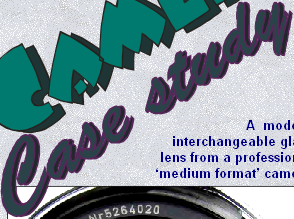 ﻿ Engineering case study for students at GCSE - Lenses in cameras - plastics and glass -A very brief look at disposable camera products and the issues and materials associated with them. 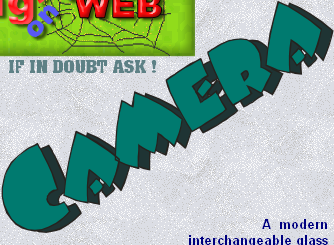 Mr Richmond Help - Design & Technology On The Web - Help for students at GCSE in Design Technology, Engineering, Product devlopment, Resistant Materials and Manufacturing. 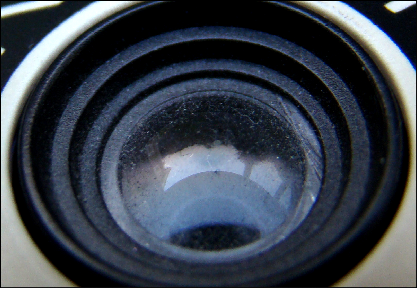 Another significant development in the use of materials in cheap (throw away type) camera products is the use of plastic lenses rather than finely ground special optical glass lenses. The lens above measures about 10mm across and costs less than £1 ( say about $2 ) whilst the lens on the right from a professional Hasselblad camera is about 50mm across and would cost about £500 (around $1000 US). A fixed focus camera simply records unsharp images when they are really close and that is why on older fashioned ‘box-cameras’ the photographer always took pictures of people several feet away. Distant views would generally look good as the sharpness range can be made to cover a wide range of distances that are further away, than it can be made to record a range of distances that are close to the camera. The purpose of the lens is to bring to a focus rays of light from distance object and whilst a pinhole will do the same, a pinhole doesn’t let enough light through to make the recording process possible. The larger the hole through which light passes the more potential light passes through and so it is necessary to add the lens into the system. 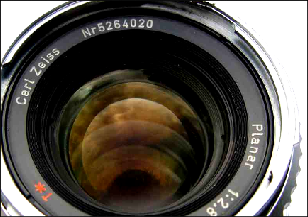 Focusing is done by moving the lens further away from the film( focus) plane as objects are nearer to the camera. Light from very distant objects is brought to a focus at the focal point of the lens. (the ‘focal length’. When 35 mm cameras were the predominant models around and the size of the image area was standardised then a direct comparison of lenses and their effect could be seen by looking at the front of the lens; this would show its maximum aperture and the focal length. The longer the focal length - the more like a telescope, would be the effect. ‘Wide angle’ lenses would have very short focal lengths. This necessary adjustment of the position of the lens relative to the film (or image sensor ) is what requires a motor to move the lens forwards and backwards. On older (studio-style) cameras this was done by means of a small rack and pinion gear on the bed of the camera’s structure. Traditional plastic materials that are used in the lens industry include, for example, polyacrylates, polystyrene, polycarbonate and similar materials which are very transparent. However, all these plastics have a draw-back when compared to optical glasses, namely their thermal expansion coefficient is about one order of magnitude greater than glass. ... That is - they change shape and get bigger - with temperature rises. This results in changes in lens shape and also refractive index with temperature - refractive index is the amount the material bends the light as it passes through - Therefore the imaging properties of the lens change with temperature which is undesirable. There is a need in the industry for transparent plastic materials which can be moulded into objects and whose refractive index does not change too much with temperature. In other words, they possess low thermal expansion coefficient. In cheap cameras this problem matters less than is the case - for example - that exists in making contact lenses and spectacle lenses. For the time being therefore - and probably for some considerable time to come - ‘quality’ lenses used in more expensive cameras will be made from glass.